Thank you for taking the time to download and test the app. 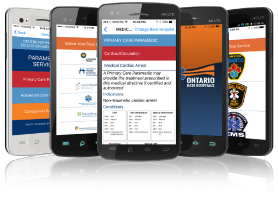 Your feedback will help us to ensure that all Paramedics are able to enjoy this inititive produced on behalf of the Ontario Base Hospital Group. Please enter your email address if you would like someone to reply to your questions. *Version information will allow the developer to do more testing and resolve issues. To find the version refer to the manufacturer's instructions. Were you able to download and install the app? What happened when you tried to download the app? Please provide specific information about what happened, "it didn't work" won't help us to solve problems. Were you able to launch the app after installing? What happens when you attempt to launch the app?